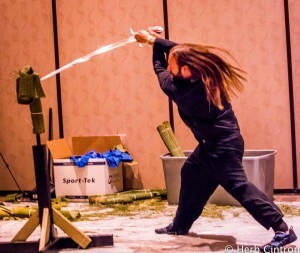 Test Cutting with sharp swords is both an important part of martial arts training and a extremely fun pastime. But as most (reasonable) people would expect any time you handle a weapon you need to give it the proper respect. Swords are designed to be weapons, and although the odds are very small you will ever see one in a self defence context you need to respect the blade all the same. Make sure you think of it as a gun that is always loaded. Take the extra time to make sure you are always thinking about the consequences of your actions. Seriously, 90% of any sword related mishaps (of which there are thankfully few) are caused by people not paying enough attention. Make sure you are cutting in a wide open area which is isolated from anywhere someone might walk into. Even if it is clear when you start there can always be people coming and going, so take stock of your surroundings before every cut. Pets and children will naturally be curious as to what you are doing, you need to ensure that will be kept away from the cutting area. 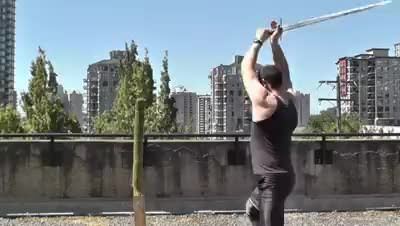 Always keep the sword tip pointed up or down when anywhere close to anyone. How close is anywhere close? It only takes the slightest mistake, miss-communication or stumble for something to go very wrong. Guess which one doesn't have me filled with confidence. Don't drink and handle sharp swords. In fact, you shouldn't really be using dull ones either. Ensure that you are using a sword that is designed to be use, not just as a decoration. Stainless steel or other wall hanger swords are not designed to cut and will likely break in very dangerous ways. Accidents cutting with sharp swords are very rare, and are most likely to happen when handling/moving/cleaning the sword. Why is that? Lack of attention. Remember what I said about thinking twice? When unsheathing a blade it is very easy to accidentally run it along some fingers positioned too close to the mouth of the scabbard. Trying to sheath a sword and missing will also have similarly unpleasant consequences for the fingers holding the scabbard. Sheathing and unsheathing the blade are not competitive events, take the extra time and care that they are due. Cleaning the blade is the least fun part of using it, but don't be in a rush. A slight slip can lead to some nasty cuts to the hands, or possibly worse. A few extra seconds on blade cleaning is many times quicker than a trip to the hospital. When you put a blade down make sure it is in a place where it won't cause harm to anyone who may not know it is there. This includes you walking out of the room and forgetting about it when you walk back in. Be especially sure that the point isn't overhanging something. Good place to stage an ambush against your enemies, bad place to put the sword down for a break. Finally, we get to do something with the actual sword rather than worry about hurting ourselves and others. Does that mean we are all in the clear? Of course not! If you are cutting in a balanced stance with a proper grip on the sword there are only a few things that can go wrong. If you are off balance, or lose control of the sword all bets are off. Of the few things that can go wrong if you cut in a balanced position, cutting into your lead leg is one of them. Make sure you cut away from your lead leg. Obviously you should never be cutting if you have a chance of slipping. Keep track of the ground condition over the course of your cutting session. After going through a few targets the debris can start to accumulate and present a tripping hazard. Keep the cutting area clean! Also remember that most cutting targets involve water, and as the ground gets wet it can get slippery. 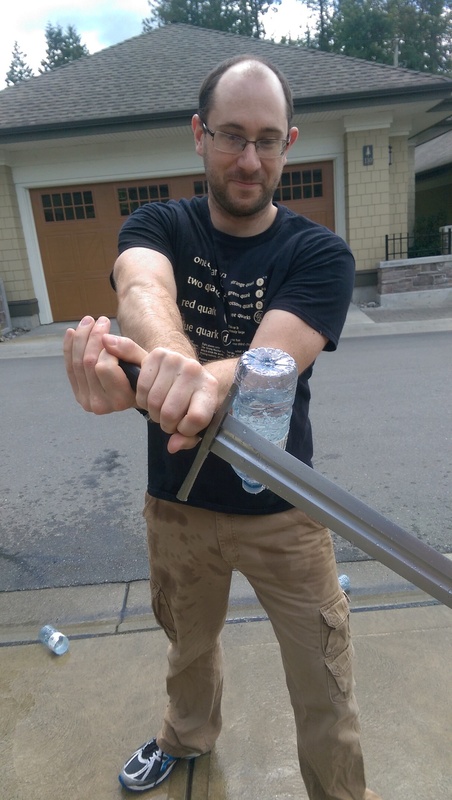 Hands can get wet from handling cutting medium and make it harder to grip the sword. It can also be a problem if oil from the last blade cleaning is left on the hilt, so make sure the sword has a good grip as well. Test cutting is meant for you to test the skills you have practised in regular drilling. Introducing new cuts or footwork patterns is best left for appropriate simulators and not with live blades!